6 at a meeting of the International Astronautical Congress in Guadalajara, Mexico, the Starship transporter is designed to carry as many as 100 people Moon and Mars In true SpaceX fashion, both the rocket and the transporter will be reusable: able to launch, land, and repeat many times. SpaceX is about to be private about its affairs, but not much gets past the company biggest enthusiasts In January, eagle-eyed observers near the company's Texas facilities spotted the appearance of a silver spaceship on the otherwise flat landscape, which Elon Musk confirmed to be SpaceX's Starship. ck-and-white paint scheme of the Falcon series of rockets, the Starship transporter sports a shiny, stainless steel skin that evokes a vintage sci-fi vibe. Musk says the vehicle is a prototype version of the craft that will one day ferry humans. This prototype is now preparing to take part in a series of short flights called "hop" tests. According to FCC filings, it will conduct both low- and high-altitude flights that could climb as high as 16,400 feet. The transporter that will conduct those flights will be powered by three engines identical to the one test-fired on Sunday. In December, Musk hinted that hop tests would start in early spring. But in January, up to 50 miles per hour knocked over the prototype, breaking the blocks that secure the Starship to the ground, Musk reported on Twitter . The needed repairs might push out the timing of the tests. Sunday's test was not the first time a Raptor fired up, but it does represent the first test of a "flight-ready" engine. Afterwards, SpaceX posted on Instagram that the engine had reached about 60 percent of its power — a milestone for the Starship program. Unlike the engines currently powering SpaceX's Falcon 9 and Falcon Heavy, which uses a mixture of kerosene and liquid oxygen, the Raptor is fueled by methane. (SpaceX's competitor, Blue Origin, is also developing a methane-fueled engine called the BE-4.) Mars has a generous supply of methane, which could make any rockets that land there relatively straightforward. Musk has said he will divulge more of the vehicle's design details. Some of its specifications have been changed from what he’d previously released. When the concept of an interplanetary transport system was first revealed, for example, it had said that the rocket would be constructed out of carbon-fiber composites. The debut of a metallic prototype show that SpaceX pursued to different tack. Musk says that the stainless steel alloy that makes up the Starship can withstand the temperatures experienced during the different phases of spaceflight. Compilation of the Atlas rockets of the early space program, the Starship's metallic skin has much thermal shielding as other materials. And areas that take the brunt of the heat during atmospheric entry will be actively cooled with residual liquid methane. 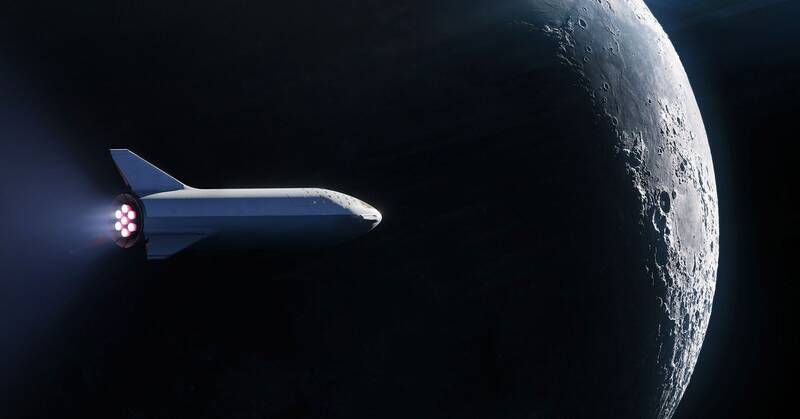 The vehicle will also feature landing legs and windows that can be seen on board during flight.
. Last September, SpaceX announced that it had signed its first passenger to fly on the Starship transporter. Yusaku Maezawa and a gaggle of artists will embark on a weeklong journey to the moon. The mission is planned for 2023, but developing rockets costs money, and the feasibility of SpaceX's Starship has been in question since its inception. So far, Maezawa's trip is the only mission for this vessel, but as SpaceX moves through the design process and Musk reveals the rocket's capabilities, more missions could come. its development as "absolutely insane." According to the CEO, the work on this project and the company's space-based internet endeavor, dubbed Starlink, is what recently prompted SpaceX to restructure its workforce, laying off 10 percent of its staff. In the explanation of the SpaceX layoffs during last month's Tesla earning call (where Musk is also CEO), he described it as a preemptive measure, since such massive projects have bankrupted other organizations. says that SpaceX plans to build its Starship as quickly as possible. But first, SpaceX has been able to safely transport people — starting with a different, existing rocket, and an upcoming trip to the International Space Station.